This is usually the post where I go back on the year with photos and remember, but I don't want to do that this year. 2014 was, for me, up in the air. I didn't know what I wanted to do with myself so I started and stopped school. I still don't know what I want to do with myself, but having the opportunity to be a Mum is the important part. I like molding her into a better person. She is lovely despite my posts about her being a beast sometimes. She's a sweetheart. For me this is confirmation that I am doing something right. There is no harm no foul in discipline. There is no harm in removing your child from a situation even if she was not at fault. There is no foul in saying no. It's something I take seriously. It's the real version of playing The Sims. She needs to eat. She needs to learn. She needs to sleep. She needs to play. Like the Sims, you are in control of what happens to your Sim. As a parent, I am in control of what happens to her. It's the most important part of my life right now. I don't know what 2015 is going to bring me, but I'm ready for it. More ready than I was in 2014. Love those early morning bangs on my window to move my car so someone can get into the back. Love them. While I was laying in bed swearing about it, I realized how hot it was and got to thinking about a portable swamp cooler we bought one year to dull the heat of the Mojave desert. Then I got up and searched my hard drive for a photo of it. Then I found this photo of a Voss bottle. I can't remember how my obsession with Voss bottles started, but this one was plastic and huge. I have four glass Voss bottles now. I require six for my fridge life to be complete (Livian). Miss my Acton kitchen! If I told you the amount of stuff we just walked away from and left for pretty much anyone to take, you'd think we were crazy. Somehow I went from swamp cooler to an SR-71A Blackbird. The family are going to the beach today to camp for a few days. I do not camp. I refuse to camp. It is not my thing. It's like when we went to Tora a few years ago and I booked a bach instead of camped. Booking a bach is my kind of camping. I'll never survive the Apocalypse. Not just kids, adults too, are pretty addicted to their gadgets these days. 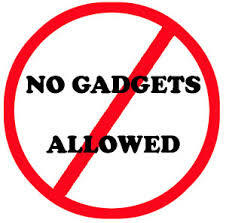 Majority, now, have gadgets, but what's a gross abuse of them is when you're in a room with people glued to one. You go unnoticed. No one says hello or goodbye to you because there's something more important onscreen. I was half way through a conversation the other day and someones phone beeped and their reaction to check was quicker than instant. There is no reality anymore because people choose the alternative and unfortunately, you need a gadget to access that life. It's bad enough people over share on Facebook, but when their stories overtake you to a point you ignore family members, then there's a problem. Facebook is a cesspool of woe and deceit. Instagram has people grasping at a life that isn't theirs. When the sob stories of others become your sob stories, there is something wrong with you. When an alert becomes more important than time, there is something wrong with you. When you don't notice someone has left because you didn't know they were there in the first place because your phone was charging and you were watching it like a hawk to flick back on, there is something wrong with you. My WiFi is not the family hot spot anymore. I vow not to bring my phone with me if I'm coming to visit you. Do the same or the visits will stop. There were no kids in sharing time today, so here I am at home. I was late to church to start with so I'll consider the lack of children a bonus. My siblings are an acquired taste. I needed to get that out because it's true. I can't take brother 3 and sister together and when I have a conversation with brother 1, I'm the only participant of it. I realised yesterday, I cannot take them all together in the same room. Technically, like Hubba, I'm one of several .. mentally, like Hubba, I'm an only child because I was raised away from the herd rendering me normal. Sister arrived yesterday with her brats. Shots from yesterday. Bebi loves the freedom he has here in Ruralville. Chocolate is an easy gift idea for Christmas. It's either chocolate or shortbread cookies. I'm all chocolated out. I decided long ago never to walk in anyone's shadow that 2015 will be different, consumptionally speaking, because to be frank; we're all out of sync. I'm 36 next year and I started feeling old when I was 34, physically. My shoulders ache all the time, my ankle does some random crap that almost has me falling over somedays, I have too many grey hairs to pick out anymore and I've eaten well this Christmas (or the last 15 Christmases). Brother 3 took care of my scorched almonds today and there's a box of favourites in the fridge that will be the last. Not that I want to live forever, because I'd like to join Larry in the Spirit World sooner rather than later, but for Hubba's sake .. I'd like to see her graduate University before God takes me. Have not yet convinced myself that a gym membership is necessary to live better. Yesterday my Uncle told me he was waiting for me to show up at his gym in town. If I wasn't trying to be an example to my Dad and his wife, I would have shown him the middle finger. To better living everybody .. physically for now, because my swearing can't be helped. My tree was down at 8.45am and Hubba knows it's all over until next year. Early wake up to go down to The Parentals and put the turkey on. Woke Hubba up early to open a few presents and while I was out of the room for two minutes, she managed to dent all of them so she could open them all. We all migrated out to the farm to visit my Dad & Nick. Nicki, Livian, Ngawi & Hubs. The girls reading Aunty Jazzy's journal. Rome & her Christmas bow & arrow. Some of us, but not all of us. Multi kai cooker aka The overground hangi. Then, like the bumpkins we are, the kids went on a rural sleigh-ride (steep hill and cardboard). When you're from the boondocks, you make do. Papa Greg went Christmas fishing and caught a King fish big enough to swallow Winston the dog. And that, my Internet compadres, was Christmas.